Burns, melting or staining from heat sources such as frying pans and saucepans. Stains from spelt foods and drinks such as food coloring, curry's and wines. General wear and tear from constant surface traffic that wears out the surface over time. 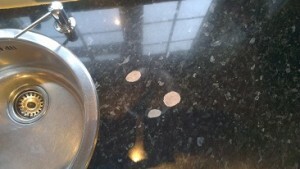 Scuffed and scratched worktop repairs from coffee pots and kitchen electric items along the surface. Cut marks left by unprotected surfaces when chopping vegetables or cutting up meat. Repair and Restore are able to fix all types of worktop repairs. Laminate essentially means covering of a surface or 'Laminating'. This word is widely used for various surface coating materials . This means that it can have various meanings dependent on what referring material. Common uses of the word include Melamine, multilaminar veneer or timber veneer, plastic wrapped and even paper rolled surfaces can all be classed as a laminate. All of which can be repaired. Majority of laminated surfaces cover inferior and cheaper structuring materials to protect them and keep cost down. Common types of laminated structure are real wood, plywood, chip board and multi-fiber board. Laminate worktop repairs are one of our most common types of repairs carried out for home builders and contractors. Laminate is the most popular worktop because it a has a variety of advantages which range from; little cost, reasonable reliability, low maintenance, resistance to water and mild chemicals or cleaners. as well as a mass of other unique designs only available to laminate materials. 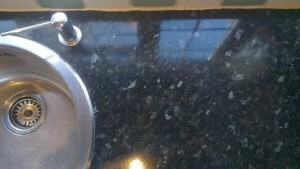 Laminate worktop repairs are performed with relative ease, even drastic types damage can produce results which are most impressive An invisible repair is achieved with great results 99% of the time. The other 1% of repairs are noticeable if looking for the repair in the correct light and angle. One of the problems associated with certain aspects of finish is in achieving an invisible repair to high gloss, gloss is a hard and an awkward finish to match 100%, even the most skilled engineers would find this. Often an acceptable finish is achievable but the outline of the clear coating to the spot repair will often be noticeable when the area is hit with large amounts of natural lighting. There are certain products that engineers use that help reduce this effect but perfect results are not always achieved, this effect is also inherent in-car manufacturing and household decorating. It is harder to make the perfect finish on laminate when compared to paint or lacquer because the surface is essentially a dyed plastic. Plastic or laminate surfaces are none porous, key the surface to allow coatings to adhere to them, it is possible to blend out the repair with a protective layer to make it invisible but this would also run over the areas that are UN-keyed and the repair would fail in little time, one option is to re-coat the entire surface to make an absolutely flawless repair.